Artisana Giveaway! Organic Raw Nut Butters and More. You guys know when I'm obsessed with a product. I tweet it. Rave. Gush. And whip out the camera. Foodie flashbulbs galore. 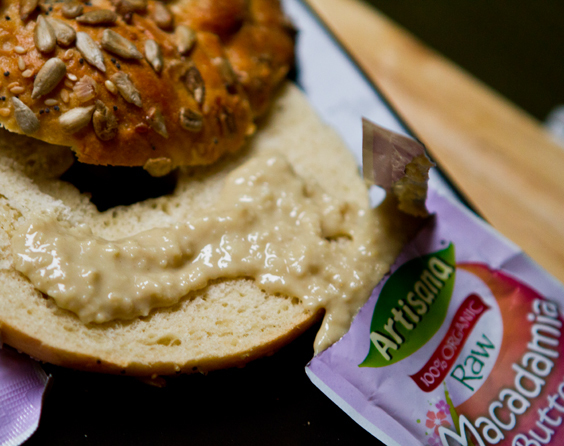 My latest product obsession comes from an awesome organic, raw brand called Artisana. Creamy, dreamy, rich, organic nut butter spreads (and more) so lovely that I simply had to ask them to allow me to host a giveaway of their goodies. They obliged me and I'm happy to offer you a chance to win their "Artisana Basket of Goodies!" GIVEAWAY HAS ENDED - Congrats to Cee for winning!.. Artisana. Raw. Organic. You may have seed their nut butters, coconut oil or tahini spreads at Whole Foods or other high quality natural foods stores. Upon moving to LA I've spotted a whole host of new-to-me products. 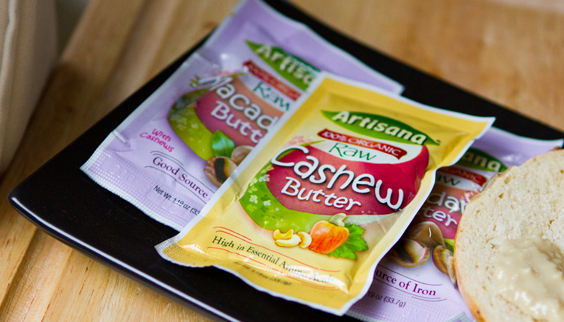 Artisana's nut butter squeeze packs are my latest find. I luff them. Nut Butters. I can't fully describe to you the bliss and enchantment associated with this nut butter. 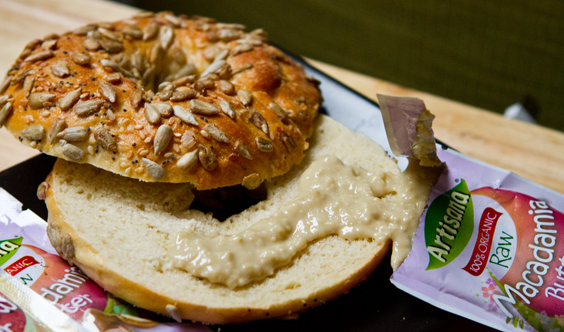 If you think your run of the mill peanut butter is as good as it gets - think again. This stuff is mind-blowing. If you've ever had raw nut butter you may know what I mean. 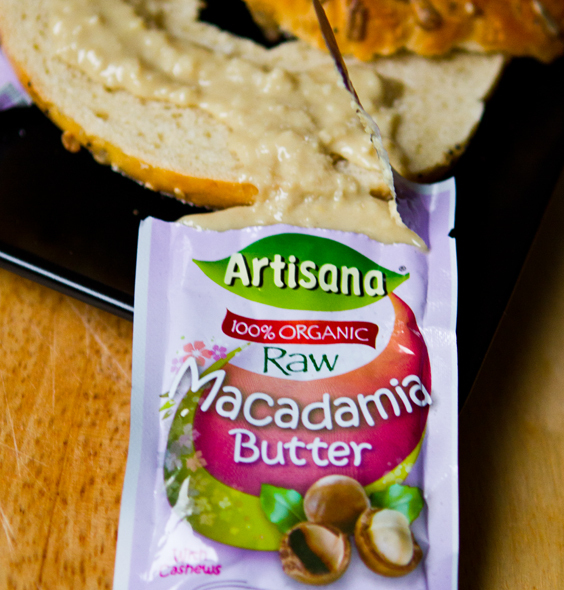 Raw, organic, Artisana nut butter is just ridiculously yummy. Even if you don't win the giveaway - seek some out and give it a taste. 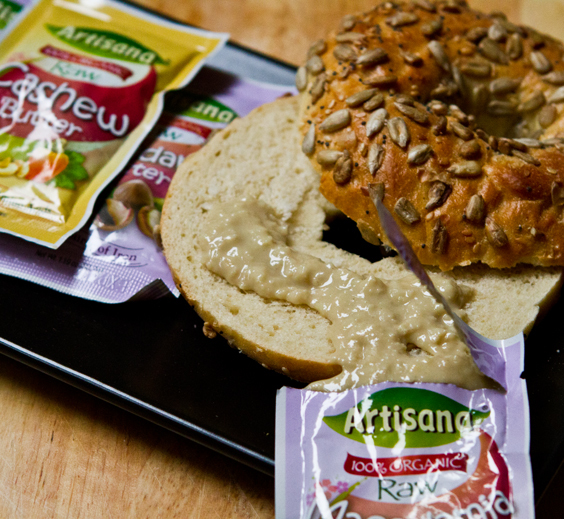 OK so the downside to Artisana nut butters versus your everyday nut butter is that they are not cheap. I paid $1.49 for one squeeze pack at Whole Foods. But you get what you pay for! 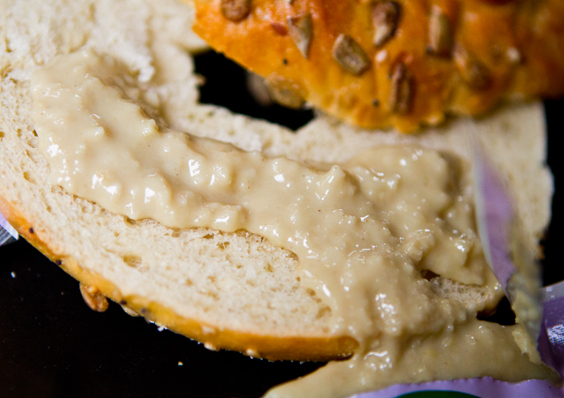 These nut butters are so rich and creamy you'd think they were bad for you. Ha. No way. They are oh so good for you. Loaded with healthy fats, enzymes, vitamins, minerals. My have flavors: cashew or macadamia nut/cashew blend. Artisana recently posted this on their Facebook page: "Did you know that over 80% of the fat in macadamia nuts is good-for-you monounsaturated fat? Macadamia nuts also contain the highest levels known of paimitoleic fatty acid, a beneficial fat also found in fish oils. When eaten as part of a heart smart diet, macadamia nuts can help further reduce the risks for cardiovascular disease." So I'll stop raving, I think you get it. Now for he good part: The Artisana Giveaway!!.. *ENTER -> enter by commenting on this post. You must comment to gain initial entry into the giveaway. Comment by telling me what your favorite nut is and why! * tweet this post and include @replies as shown: " I just entered the @ArtisanaFoods Giveaway hosted by @Lunchboxbunch - enter here: http://bit.ly/rHakOb "
Artisana says.. "Using the most careful attention to detail, quality and handmade with care, our organic raw foods are crafted using a temperature controlled process that preserves the life-essential fatty acids, enzymes, vitamins and minerals." Be sure to connect with Artisana and tell them how much you love them as well!..